Yup… that build plate is pure magic! Anyone else have a tracking number but no movement of the delivery? Same here. I contacted the Support, and the answer was: The DHL email only indicates that your shipping labels are ready, but it doesn’t necessarily means that your order is shipped. You will receive a notification from Shopify when the order is shipped. I thought that was the case but I was not sure if I was missed or it was just taking a while. Except… I received my kit the day before I got the Shopify notification… so go figure that one out! 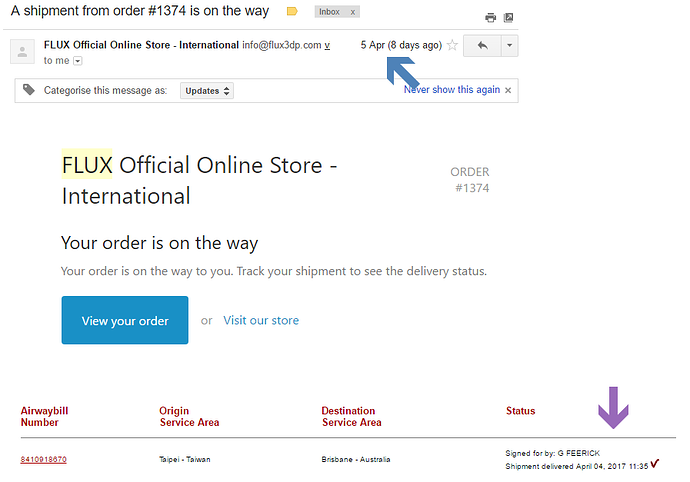 I got the DHL notification of the label created on the 30th of March, the parcel arrived on the 4th of Apr, and then I go the notification from the Flux store on the 5th that it was on it’s way! Refer to the other post about shipping…Flux states they will have another bunch shipped out next week. Like you, I’m still waiting. The shipping label has been made but the shipment has not been made yet…Upgrade kit shipping? Same here, DHL status says “No information available”. I received notification from DHL that my order was shipped. I few days later notified by local DHL that it was here. Had to do the Customs dance with them, and had the kit 2 days after that. I never received anything from Shopify, and it certainly did not go to Spam/Junk as I have an account with them and get (too many) emails from them regularly. I finally got my official it is on the way email! I have been holding back on some prints so I am very excited! I just got a notification from DHL to expect my upgrade kit later in the week as well! My upgrade kit arrived yesterday and I opened it this morning. There is an issue with the super glue for the scanner pole upgrade. Obviously the glue opened up while shipping. I am extremely impressed with the packaging and package insert. Great overview of the parts etc. Actually excited about following the videos and having a go at upgrading the machine soon. Finally got mine yesterday! I managed to miss the first stealth delivery. I had 5 people and 2 dogs in the house and DHL still managed to miss me. I now have my weekend project! FYI, no custom or import fees for me (Ottawa, Canada). You are lucky! I am also in Ottawa, Canada but had to pay Customs duty & Tax, maybe because my invoice was for more than $100 as it included a spare printhead. I have never received any coupon for the upgrade kit. Why make it so complicated especially for original backers? Man, I got a coupon for the upgrade kit (i think) that turned into a $10 off coupon?? I wonder if its too late to request an upgrade kit? I’m not sure if the promotion for the upgrade kit is still happening, but it wouldn’t hurt to email them and find out. I did log into the store, and I have to say that the replacement parts are quite affordable. You could build a cart that had all of the upgrade components in it, and still do alright for yourself.